RF Generation is an awesome site, but... it can be better. I should know, I coded the PHP files and the HTML. Clearly, I am the expert. So, imagine my surprise when Den provided me with the best invention that would grace this site. What could that invention be? What could make this site the best damn site on the internet? Why... it's our 2D Glasses. Doesn't Den look awesome? Well, guess what? 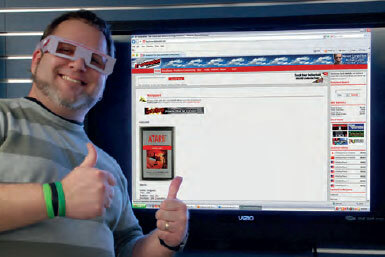 Those glasses make this site look best. So, I suggest you get your own glasses. You can then appreciate RF Generation for everything it is. We look best with our patent pending 2D Glasses. So please, pick your own up today. Send us what you look like! Sweet! I'll put these together and wear them around work. I only work in 2D anyways. D@mn, that's a big freakin' monitor.